Canon Pixma TS9150 is designed with space saving concept in mind. The printer has a small footprint with approx 372 x 324 x 140 mm dimensions. This handy printer with 6.7Kg is perfect for your office desk and can fit easily into any corner of your home. The printer provides optimum print quality with 4800 x 1200 dpi resolution. Also, the printer offers average printing speed with 15.0 ipm for grayscale print and 10.0 ipm for colour print. The printer is embedded with 12.6cm LCD screen for easy navigation. 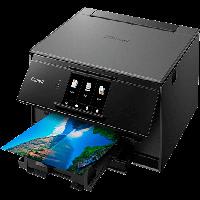 This Canon Pixma printer is backed with Wi-Fi facility and various apps including Apple AirPrint, Google Cloud Print, Mopria for Android, Windows 10 Mobile, and the Canon PRINT app for easy printing. Moreover, the printer uses separate 6 Canon Pixma TS9150 ink cartridges for flawless print. XL and XXL ink cartridges are also available for the one who performs frequent printing tasks. If you run out of the ink, then you have to replace only the expended ink cartridges, which ultimately reduces the maintenance cost. Canon Pixma TS9150 is a compact printer with a pack of multiple features which makes printing, copying, and scanning task easy. With the support of various apps and Wi-Fi connectivity, the complexity while printing the document is eased. The printer uses 6 Separate Canon Pixma TS9150 ink cartridges, for providing top quality print. The printer is perfect to fulfill the home printing or small office print. What are the major things to remember while replacing Canon Pixma TS9150 ink cartridges? When you are replacing the ink cartridge, you need to follow the procedure. Step 1: Firstly, you need to make sure that power is turned on. Step 2: Open the scanning cover. Caution: Avoid holding the print head holder to stop or move it forcibly. Remember to not touch the print head holder until it completely stops. Step 3: Remove the ink cartridge whose ink runs out. Do not touch other parts besides the ink cartridge. Handle the ink cartridge carefully to avoid staining. Note: Do not remove two or more Canon Pixma TS9150 ink cartridges at the same time. Make sure to replace the ink cartridges one by one when replacing two or more cartridges. Step 4: Take a new ink cartridge out of its package, remove the orange tape and then remove the protective film present on it. Note: Handle the ink cartridge carefully. Avoid applying excessive pressure to it. If the orange tape remains on the Y-shape air hole, the ink may splash or the printer may not print properly. Step 5: Hold the Canon Pixma TS9150 ink cartridge with the orange protective cap pointing up and be careful not to block the Y-shape air hole. Step 6: Carefully lift up the label on the orange protective cap to remove it off. Step 7: You need to insert the front end of the ink cartridge into the print head at a slant. You need to be sure that the position of the Canon Pixma TS9150 ink cartridge is matching with the label. Step 8: Gently press on the top of the ink cartridge until it fixes firmly into place and then close the scanning cover. Note: If you are removing the ink cartridge, try to replace it immediately. Do not leave the printer with the ink cartridges removed for a long time. Q. What should I do if my printer is printing smudged or distorted pages? A. If prints are not appropriate and your printer is printing fuzzy and blurry prints, it might be possible that the ink in your Canon Pixma TS9150 ink cartridges is low. There could be another possibility that the print heads are not cleaned. Generally, modern printers perform some type of cleaning test to check and clean the printers print head and other internal equipment used for printing. By performing the necessary operation one can get rid of problems associated with it. Q. How to handle the Canon Pixma TS9150 ink cartridges? A. If your printer is not delivering the ink properly, firstly check that the cartridges are not empty. In case they are, carefully remove the old cartridges and install the new ones by following the guidelines given in your manual. Also, do not place the print head in contact with any surface besides the designated contact points. Q. What kind of paper is recommended for printing the documents? A. For printing high-quality documents, it is always recommended to use glossy paper. Each paper you use has a weight, a processing type, and a finish. It totally depends on the type of work you are performing. Q. Do you provide any discount if I order cartridges from your site? A. There is no additional discount offered on the cost of cartridges. However, one will always save huge on the ink cost if order for the compatible ones. Q. Are the Canon Pixma TS9150 ink cartridges supplied on your site refilled or original ones? A. We at printerinkcartridges.ie supply high-quality compatible ink cartridges that perform an equal number of printing operations as you get with the original ones. With trusted results, you do not have to compromise with the quality if you go for the compatible ones.